Winter is coming but the forecast of a few showers did little to stop the road warriors from assembling for a feast. A BMW 1600 GTL had pristine white lambswool covering its throne, quite remarkable given its life in the red dirt region. An immaculate PD also rolled up. His Royal Griceness reported that he had dremelled his ferrule securing his throne and was able to change his filter. A bit of discussion about a 2CV being McFarkled across the Nullarbor and losing its roof when a truck sped past. Eight riders and a pillion set out for the York motorcycle show but by the time we got to the Lakes it was ten and three pillions. Goldie, Ross + Bernadette, Bill + Trish, Bob +, Mark, Peter, Clayton, Henk, Peter and Bozo headed up the Darling Scarp at Lesmurdie to take Repatriation Road to Patterson Road through the Bickley Valley. A bit of Patterson Road was being widened possibly to make it safer for cyclists like the ones we encountered just before Walnut Road. The red light bridge single lane is still in place on Mundaring Weir Road but the extensive roadworks are just at the clearing stage. The group safely passed the wall at Mundaring Weir with just the odd white walker on the Bibbulman Track. What looked like a multanova equipped vehicle set up to be rear facing was parked just out of Mundaring in the 50 kph zone. 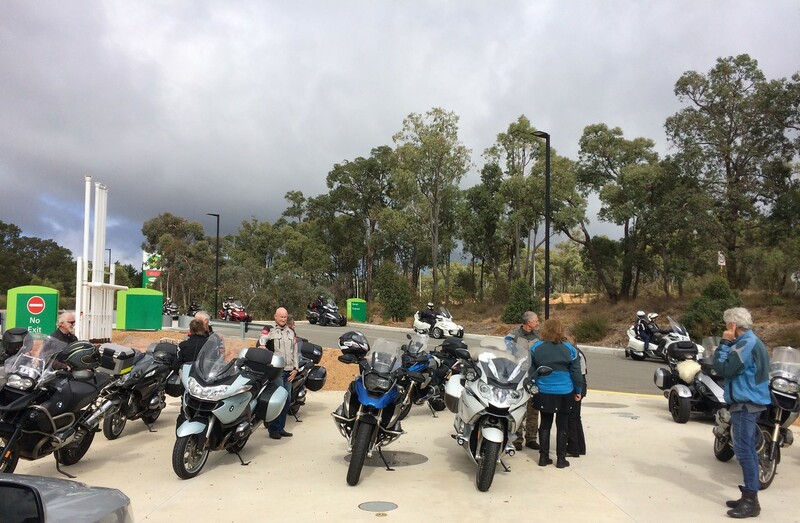 The Dome at Mundaring was infected with Harley Davidsons as we rode past to motorcycle central at the Lakes Roadhouse. Turning off onto Yarra Road/Talbot West Road the traffic dramatically thinned and it was a smooth run to the York Williams Road to take a shortcut to the Top Beverley Road. Before entering the chaos of York a muster point on the north of town was arranged. York was packed. Lefty's bike and trailer were spotted next to the stage. Auto Classic and Motorrad Garage had displays and the predominant noise was the revving of motorcycle engines. Six headed to the relative sanity of Bakers Hill via Burgess Siding Road and Spencers Brook Road with a short cut to Great Eastern Highway via Trimmer Road. BJ arrived at Bakers Hill just after us as the rain started. A road block for a breathalyser test was passed with flying colours and Coates Road, Burma Road and Bailup Road got us to Gidgegannup where the ride ended. Very happy that Peter, Clayton and Henk joined us from a kingdom to the north (Geraldton, Hutt River and its hinterland). Thanks to Peter for running as Tail End Charlie. A cavalry of Can Ams arrives as we regroup at the Lakes. Great ride thanks Bozo. We were lucky to miss most of the rain with only a light shower returning to Perth.